Netflix has entered the faith film market. It maybe the production of essentially the faith story of a Unitarian-Universalist, but the vibe of the feature is very much that of any Christian movie production. It is the journey of transformation, for what happens if as someone that always has preached they are the messenger of God– they get a message from God? That is the true story of Bishop Carlton Pearce, who for 25 years was the rising star of Pentecostalism; Oral Roberts “adopted son” (and the university’s alumni) and the shepherd of a mixed race mega-church. 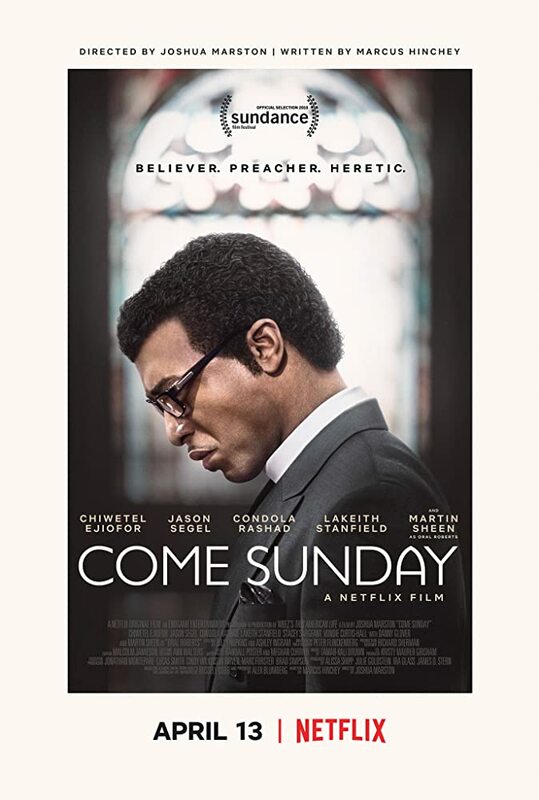 Come Sunday (2018) is the story of his mystic experience as he hears of the Rwandan genocide and begins to wrestle with the fundamental drive of the evangelical endeavour. Salvation of the sinner from Hell. And the voice he hears tells him simply, there is no hell all are saved that is what the cross was about. The collapse of the fear enterprise, and what it cost him in the form of pride, money and prestige. But also what it meant for his authenticity, and for the next steps in understanding Brother Jesus’ Gospel of Inclusion. It is a transformative journey as it forces the hearer, Pearce, to not only wrestle through the idea of true love, but also what it means for the here and now world. Decisions of inclusion, and belonging for people. It is a struggle out of a faith and ethic compass based solely on fear to belong, and the ultimate risk of belonging. For Pearce to risk losing the fear, he had to accept losing his comfort zone, friends he believed he had, and being labelled as a heretic (and ostracized). No journey is easy, especially one that is rooted in true belonging. What happens when you remove the fear?